Even popular, venerable breweries occasionally need a reboot. 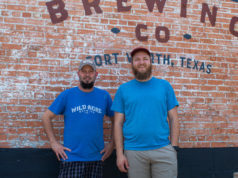 When it comes to brand recognition, awards, and fan base, few have reached Rahr & Sons’ lofty orbit, but the Near Southside-based brewery isn’t resting on its laurels. The article on Dadgum IPA will be out in print in the coming weeks. After learning about Rahr’s new initiatives, I wanted to highlight two of the people behind Rahr’s popular suds and marketing efforts. Wood comes from a diverse professional background, including photography, retail fashion, and mechanics. He admits he was a latecomer to craft beer, but he became a regular at Rahr taproom tours several years ago. 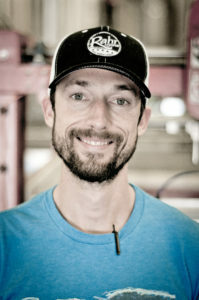 While looking for work to supplement his photography business, Rahr co-owner Fritz Rahr offered him a job managing the bottling machine. One year later, Wood was hired as creative director at the brewery. 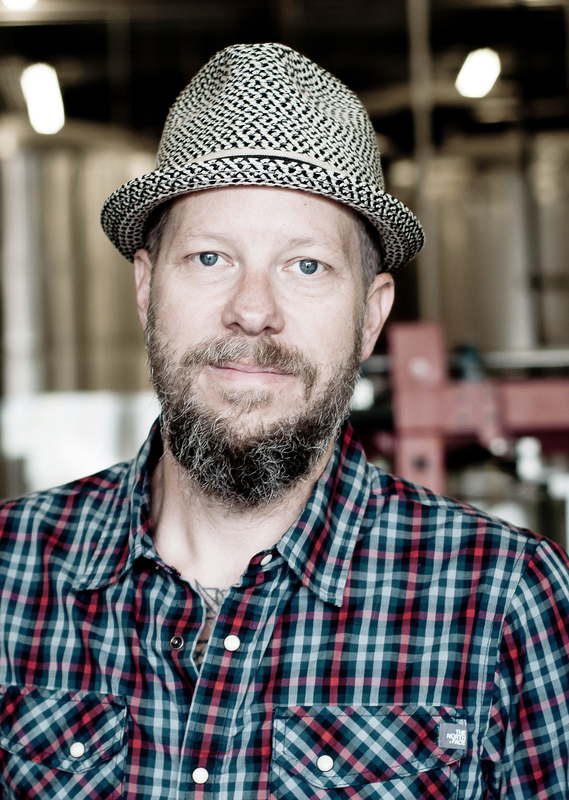 Being the creative director of Rahr may sound like a dream job. And it is. But the position also keeps Wood thinking around the clock. Take pint glasses, for example. After six years of designing pint glasses, Wood finds himself asking vendors odd questions. “Do you have edible glasses?” he recently asked one vendor. 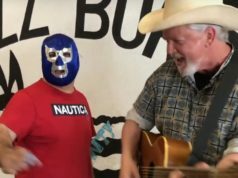 The creative director’s all-time ranking coup was an announcement on social media that Rahr & Sons was closing. 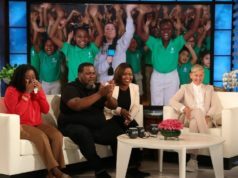 The announcement date? April Fools. What seemed like an obvious joke led to urgent phone calls from major media outlets wanting the scoop on the brewery shuttering. Like Wood, Nate Swan was a regular at Rahr’s taproom tours long before he dreamed of working there. His beer journey began with homebrewing and membership in the Cap and Hare Homebrew Club. 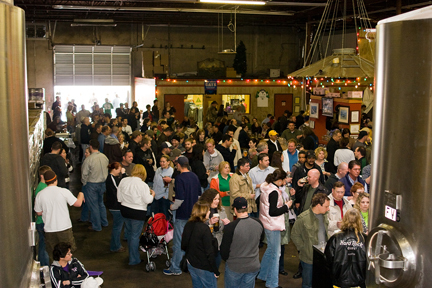 Around 2012, Swan applied for a cellarman position at Rahr. Swan’s friend Austin Heisch landed the job, partly because Heisch had volunteered at Rahr. Fritz advised Swan to consider volunteering as a way to get a foot in the door. At the time, Swan was a business administrator for a health club in the Mid-Cities. The chain’s home office was in Minneapolis. When co-workers in the home office started a brewery (612Brew), they offered Swan a position as assistant brewer. Swan asked Fritz if he could get more experience brewing to prepare for the job change. For the next five months, Swan worked with Mycoskie, learning the ropes of brewing. After the five months were up, a brewing position opened at Rahr. Kudos to the good people at Revolver Brewing for sending me a sample of Full-Tang, an American IPA made with tangerine peel and four hops. The smooth, frothy ale has a welcome tangerine scent that can only be the result of brewing wizardry. The juicy, zesty IPA was hardly bitter and delicious. My only complaint was that it was so hoistable it only lasted a few minutes. 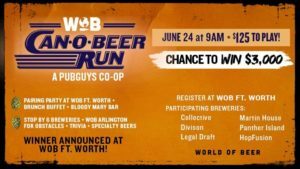 From World of Beer: WOB Can-O-Beer-Run starts at World of Beer Fort Worth 9am. We will host a pairing party that includes a brunch buffet, Bloody Mary Bar, t-shirt, scorecard, and assignments to a bus. All participants or teams of will be assigned to a bus. Busses will visit one of six breweries where each team will be challenged with an obstacle, trivia, and served a specialty beer from each of the six breweries (Collective, Division, Legal Draft, Martin House, Panther Island, Hop Fusion). Once all of the teams have completed the tasks they will then be rallied back to the busses and on to the next location to complete new obstacles, trivia, and beers. Somewhere in the transit to the six breweries two craft beer taverns that will be visited. World of Beer Arlington and Dr Jekyll’s will offer food and beer. Once all the locations have been visited, we will then report back to Fort Worth World of Beer where we will tally the scores and announce the winning team at 8:30pm! 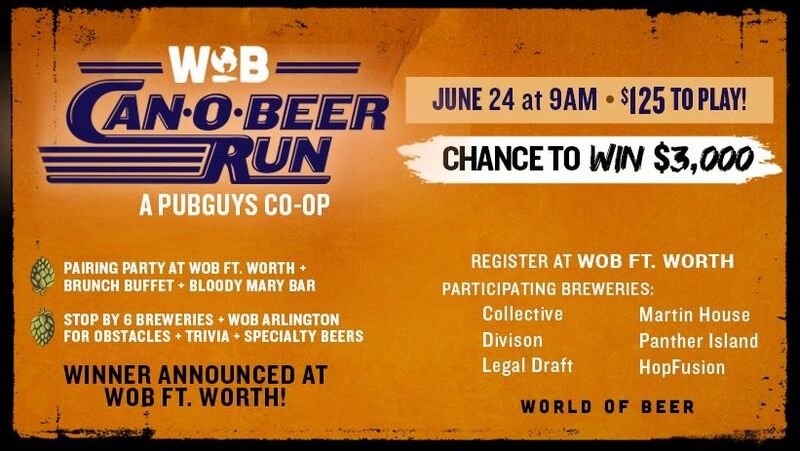 The winning team will receive a keg trophy to be displayed at WOB Ft Worth and $3,000 cash. June 24.